Spovan Silver Digital Pocket Watches Hiking Altimeter Barometer Compass | What Should I Say? 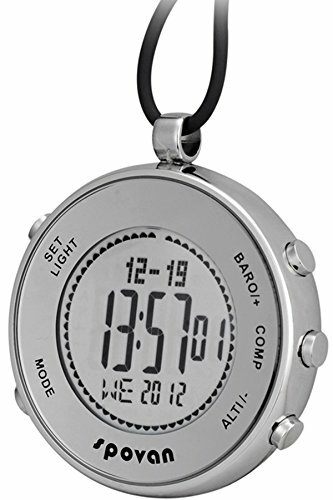 This is a professional digital sports pocket watch , suitable for men and women , 2 way to carry (Nylon rope/Stainless steel clip) , easy to hold and use , give you outdoor activities more help and delight , carabiner watch , if you like hiking, camping, cycling, running or outdoors survival, DO NOT miss it! If you have any questions about this product by findtime, contact us by completing and submitting the form below. If you are looking for a specif part number, please include it with your message.